In continuing Michael Singer Studio’s ongoing Living Shoreline Initiative, the Studio has teamed up with Connecticut Sea Grant to explore a sculpted modular living shoreline system. 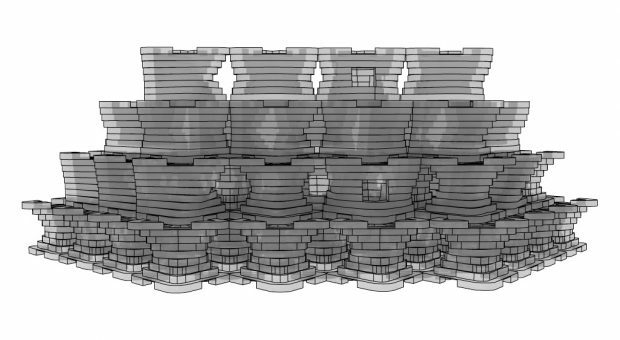 This design was developed for low to moderate wave energy coastal shorelines in Connecticut, but is intended for prototyping, and in-situ study, for potential applications in any similar coastal environment. The Connecticut Department of Energy and Environmental Protection was instrumental in securing funding for this effort by providing a letter of support to the Jeffrey Cook Charitable Trust, which generously supported this project. The team developed a sculpted modular living shoreline system for the construction of sills. Sills are shore-parallel structures built waterward of an existing (or future) coastal marsh. They break down wave energy, but are porous enough to allow water to pass through them. Sills support the establishment of coastal marsh vegetation, which in turn preserve the natural function of important intertidal habitats. The team’s design is distinctive in that the sculpted modular living shoreline system promotes the sill itself as habitat, allows for varying modules to serve specific purposes within the same sill, and is sufficiently flexible to allow different and distinct sills to be constructed as a response to specific site needs. Additionally, sill modules are designed to be easily handled and installed, such that no heavy equipment is necessary for their placement. This permits involving volunteers in installation, which opens the door for hands-on community engagement and educational outreach. At an early planning stage of the project the team scouted for a project site that would enable them to face physical realities of a specific location. In order to increase project outcome replicability and relevance to other locations, the team also conducted a Geographic Information Systems (GIS) study of roadways in Connecticut’s coastal communities. This study demonstrated that key site conditions (coastal flooding, roadway flooding, proximity to coastal marshes) are indeed prevalent throughout the State, and that the team’s sculpted modular living shoreline system may be applied to numerous locations. The full study, including a more in-depth explanation of the modular system, the initial project site, and the GIS mapping study is available online here.